The first segment - Initializing the loop counter to a specific value. The second segment - A boolean condition testing the value of counter. 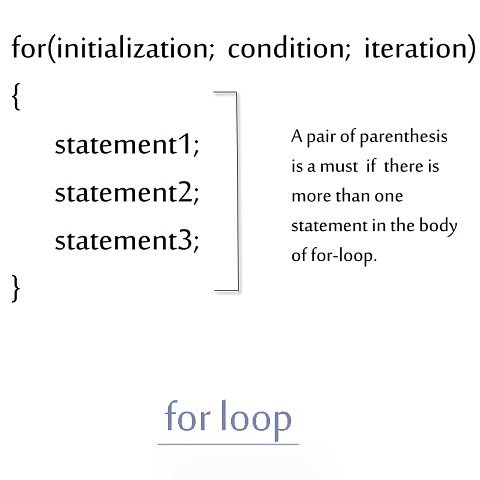 The statements in for loop are executed only if this condition is true. The third segment - Incrementing or iterating the value of counter each time after the statements in for loop are executed. The third segment of the for loop declaration i.e. iteration of counter can be intentionally left out from its declaration and can be specified within the body of for loop. In other words, the counter of for loop can also be incremented in the body of for loop. For loop with a missing initiailization part or boolean condition in its declaration. There can even be a for loop with missing initialization part or boolean condition part in its declaration. But, in order to make this for loop work properly, we will have to use break statement at the right time. Let's see an example. Note : If you remove the break statement from our last program, the program gets hanged. Hence, the use of break statement is utmost important when we have left off the initialization part or boolean condition part of for loop.